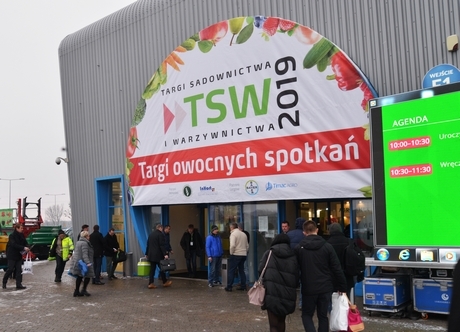 On 9 and 10 January 2019, Ptak Warsaw Center hosted the 9th Fruit and Vegetable Industry Fair – TSW 2019. The exhibition area of 23 500 m² was open for 386 exhibitors from Poland and abroad to present their goods. It is worth noting that this year, the fair hosted companies from countries such as Luxembourg, South Korea, Cameroon, the Netherlands, Italy, Belgium, Denmark, France, Austria, Germany, the USA, Turkey and the United Kingdom. As compared to last year’s show, there were as many as 112 new exhibitors. During the two days, 14 735 people visited the trade fair (the entry was registered). Many guests came from abroad: Austria, Belgium, Belarus, the Czech Republic, Egypt, Estonia, France, the Netherlands, India, Lithuania, Germany, Portugal, Slovakia, Ukraine and Italy. During the official opening of TSW 2019, Professor Pieniazek’s Prizes were awarded for the 6th time. The competition jury awarded products submitted by exhibitors which were the most innovative and beneficial for horticulture, the environment and society. In this year’s competition, the jury decided to give prizes to the following products: Bio Killer – a pest control device for field use, submitted by Agro Smart Lab Sp. z o.o., DryGair – submitted by Brinkman Polska Sp. z o.o. and LED COB PLATALUX Lamp – submitted by Plantalux Sp. z o.o. Green Sort Vision – a sorting machine submitted by Green Sort Sp. z o.o., and Kendal Root – a soil-applied biostimulant submitted by Valagro S.p.A.
As each year, an important part of TSW were industry conferences during which Polish and foreign experts gave almost 60 lectures. Both acclaimed researchers and practitioners shared their knowledge with conference participants. On the first day, the 5th Fruit Growers’ Economic Forum, the 6th Strawberry Conference and a conference devoted to ecology in horticulture were held. On Thursday, conferences on fruit-farming, field vegetables, covered cultivation and new species in horticulture took place. In total, almost 3000 people participated in lectures during the trade fair. Over 2000 people benefited from the lecturers’ knowledge by watching live streams of chosen lectures on the Internet. Oikos Sp. z o.o., the organizer of the Fruit and Vegetable Industry Fair, is taking this opportunity to invite you to next year’s trade fair TSW 2020 that will take place at the same location on 9 and 10 January 2020.